(a) An electron enters an environment of a non-uniform static magnetic field varying in magnitude and direction from point to point, and comes out of it following an irregular path. Would its final speed be equal to the initial speed if it suffered no collisions with anything during its irregular motion in the magnetic field? Justify your answer. (b) In a cloud chamber photograph of the electron-positron pair production by a high energy gamma ray photon, two circular tracks emerging from a common point can be seen. The tracks curve in opposite directions in a plane normal to the magnetic field applied in the chamber. But if this event is photographed in a liquid hydrogen bubble chamber, two spiral tracks (instead of circular tracks) are seen. Explain why. (c) Explain why a charged particle projected into a uniform magnetic field at an arbitrary angle θ with respect to the field follows in general, a helical path. Derive an expression for the ‘pitch’ of the helix. 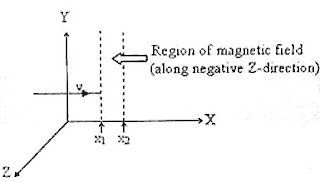 (d) A positively charged particle of mass ‘m’ and charge ‘q’ traveling with constant velocity ‘v’ in the positive X-direction enters a uniform magnetic field B directed along the negative Z-direction extending from x = x1 to x = x2 (fig.). Derive an expression (in terms of the given parameters) for the minimum velocity required for the particle to cross the magnetic field. The above question carries 15 points (3+2+5+5). Try to answer it within 15 minutes. I’ll be back soon with a model answer for you.